The rel="canonical" is a tool to deal with duplicate pages. When the same content is available at different URLs, canonical links indicate the main page. This is the page (the priority one) that will be indexed by search engines and all traffic from the duplicate pages will be directed to this main page. This tag is widely used by all major search engines. From the SEO optimization standpoint, canonical links are considered necessary for certain types of pages. In other cases, using the 301 redirect feature available on uKit would be a better solution. How Do I Set Up rel="canonical" in uKit? 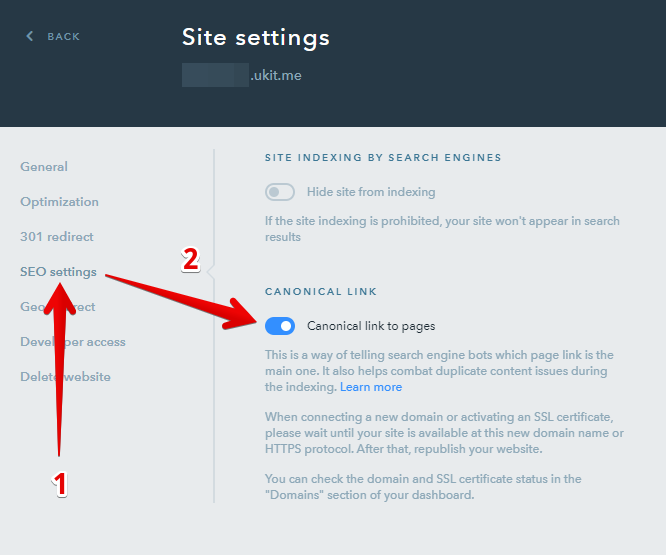 To enable canonical links for your website, go to the uKit Dashboard, click on Settings > SEO settings and toggle Canonical link to pages. When connecting a new domain name or enabling an SSL certificate, wait for the changes to take effect (the website opens at the new URL or has an HTTPS protocol) and republish the website. You can check the status of a custom domain name or SSL certificate in the Domains section of the Dashboard. 8 people found this article helpful.